Cast iron fireplace insert, and cast iron stove, very well heated, safe and convenient to use. But the heat from the stove stood out, not only during burning, it must be brick veneer or other materials that will preserve and make the room warm for a long time. In addition, to impose a cast-iron furnace is to create a decorative effect, as by itself it does not always fit in interior. - materials for the creation of a thermal brick, tiles, stucco, fireclay, marble, gypsum, etc. Pick up the materials for the outer shell, it is the choice of material will depend on the fireplace warming properties and its appearance. Choose any material, in addition to the traditional bricks and tiles are used for facing gypsum Board, marble, plaster, French rakosnik, and even glass, metal and ceramics. If you want the fireplace warmed the room all night, even when the oven is not heated, choose materials that are not afraid of the heat and accumulating heat during operation, for example, refractory bricks, tiles or plastered fireclay. Please note, this case does not require the use of isolation so that we can easily impose the furnace. If you chose materials that do not pass and do not accumulate heat, afraid of overheating, such as drywall or marble that can even crack, take care of complete fireproof foil insulation to the housing of a thermal. Of the furnace to install a podium, in front of the fireplace surely equip pad of refractory material of a length at least 50 cm and a width equal to the width of the fireplace plus 20 cm each side. Develop or find ready-made draft of the fireplace. 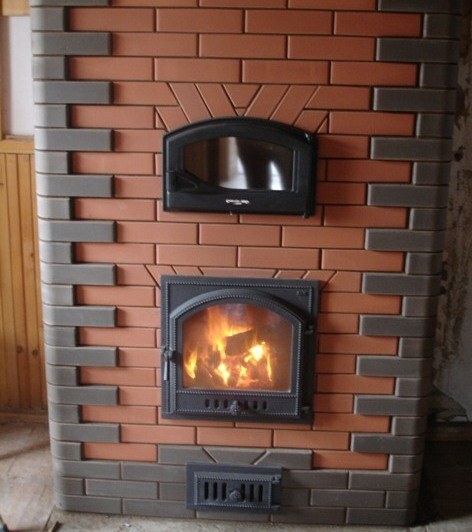 Note that the distance between the walls of the stove and the fireplace must be at least 5 – 6cm, and from the back wall – not less than 10 cm, the thicker will be the wall of the outer shell, the more heat will save the fireplace, therefore, if you value warmth, choose a project with a wall thickness of one brick. Be sure to allow for bottom supply of cold air in sufficient quantities and the possibility of hot air. Overlaid the furnace according to the selected sketch. When laying necessarily verify the position of the bricks using the plumb Bob, tight string and level. Make sure the seams were smooth and identical. After the entire furnace is lined with brick, make the chimney, isolating it with special materials. If you impose your stove ordinary brick, after complete drying of the masonry stone decorative heat chamber heat-resistant tiles. If brick veneer fireplace smokes, try to use to replace the wood on a dry or clean the chimney of soot.